Koma’s stuff is good. Really good. So good, you might even want to watch a hands-on video where I’m juggling a camera in one hand and a glass of champagne in the other. Their stompable, playable analog effects show well even in the back of a van circling Musikmesse. How I came to see this hardware in the van is a story in itself. The trade show gig works like this: you pay an enormous amount of money for some sort of trade membership, then an enormous amount of money for a booth, an enormous amount of money to staff that booth in the form of hotels and travel, and then an enormous amount of money for obscure charges like wireless Internet that doesn’t work right and union staff to unpack your gear and so on. Exact details may vary, but you get the idea. For an independent maker, it often just doesn’t make sense. Berlin-based Koma Electronik had another idea. “Carpet-bagging,” the term for using your badge to sell your product without a booth, is a strict no-no at these trade shows. But the trade show can’t tell you what you can or can’t do outside the convention. 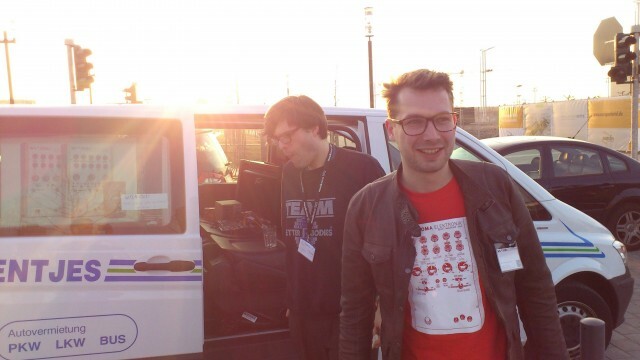 So, at Musikmesse, Koma promised demos in their “limousine” or “Koma Cab” – really a rented van outfitted with an amp for live demos of their gear. Since they’d saved some money, they could even offer free champagne and caviar. The system was easy: call them up, and they picked you up for a ride and some music. Here, we get an in-depth look at two Koma effects, the FT201 filter/sequencer and BD101 gate/delay. On first glance, these may remind you of the superb Moog Music Moogerfoogers. But in usability and sound, the Koma boxes are very much their own beasts. I always loved on Star Trek: The Next Generation when someone would bark “disable safety protocols.” That’s the feeling of the sound here, whether controlled with your fingers, your feet, control voltage, or distance sensors – all appealing to modular synth lovers, computer users, and guitarists alike. In particular, the gate/delay is capable of some far-out effects, so if you’re bored with me and Koma’s Wouter Jaspers (come on, why? ), uh, skip ahead a bit for some really wild sounds after a couple of minutes in the second video (below, bottom). Kristin Trethewey has a separate look at the Koma crew for CDM, but for now, enjoy the videos. Part one, above, shows the filter; the delay is below. We ask readers: which song fits this scenario better, Dragonette “Black Limousine,” or Ladytron “Back of the Van”?